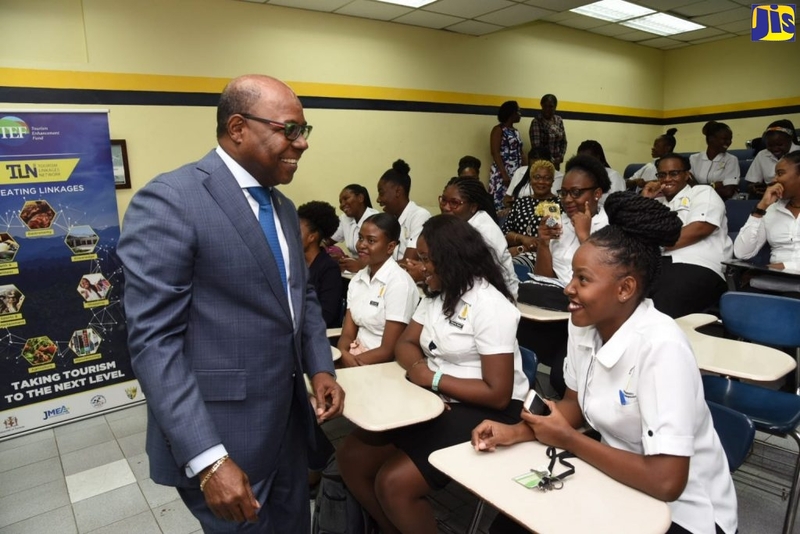 The National Security Ministry, through its Citizen Security and Justice Programme (CSJP), is bringing positive changes to the lives of residents in a number of violence-prone inner city communities in Kingston, and giving them hope for a better future. Community Action Programme Coordinator, Orville Simmonds tells JIS News that the programme, which has been in operation since 2001 after its conception in the late 1990’s, was part of the response to the rise in crime during that period. The initiative also boasts a criminal justice outlook managed by the Justice Ministry. This component, Mr. Simmonds explains, involves assessments of the island’s rehabilitation system including the Department of Correctional Services, the court system, the Family Court, and comprises initiatives to strengthen the Police Public Complaints Authority as well as to enhance the crime management capabilities of the police through the provision of capacity-building technology. But at its heart, the main focus of the CSJP, is reaching into some 14 inner-city communities growing from nine in the first instance. The communities are Waterhouse, Towerhill, Drewsland, Denham Town, Trench Town, Hannah Town, Fletchers Land, August Town, Grant’s Pen, Rockfort, Mountain View, Kencot, Cassia Park and Allman Town. The Programme Coordinator that says the high levels of crime and violence, poverty, capacity and willingness to participate in the programme, formed the basis on which the areas were selected. The communities, in the meantime, also identified crime and violence prevention, unemployment, education and training as the major issues to be addressed. The approach is a multi-agency effort geared at repairing the torn fabric of inner-city life and six non-governmental organizations (NGOs) provide a range of services, targeted at youth at risk. Creating a vital link between the NGO’s and the communities are the Community Action Committees (CACs), which “act as the voice of the community” and provide direction as to the priority services or needs. Among the NGOs operating in the areas are the Peace and Love in Schools (PALS) programme, which works in schools to provide training in conflict resolution for staff and students, and the Addiction Alert Organization, now known as RISE Life Management Services, which provides life management skills and substance abuse counselling and education for youth and parents. With studies showing that students from these communities have very low passes in Math and English, the Kingston Restoration Company (KRC) has come on board to offer remedial education and classes in the subjects, in addition to homework assistance. Through the Sistren Theatre Collective, popular theatre is being used to pass on information and build citizen’s awareness of issues such as domestic violence, youth and violence and organized crime. Residents also receive mediation training from the Dispute Resolution Foundation and mentoring services from Youth Opportunities Unlimited. While most of the initiatives are targeted at the youngsters in the communities, the parents are not left out of the picture, as according to Mr. Simmonds, one of the lessons learnt by the NGOs is that, “there has to be a significant level of parental involvement in the programme.” As a result, he says that the KRC’s homework assistance programme, which at the outset did not carry a parenting component, was revised to include such. Furthermore, workshops have been conducted to address parenting issues. There were similar changes under the Addiction Alert, Youth Opportunities Unlimited and PALS programmes, where it was also discovered that parental involvement was crucial. As a result, PALS is now involved with the Parent Teachers Associations. Parenting associations are also being established and the CSJP Coordinator says results are being seen in the support received from parents towards services for the adolescents and the remedial education programme. Home visits are also a part of the package. “Some of the NGOs do home visits especially RISE and social workers, and again we see where the involvement with the parents is bearing fruit so by and large, that is one of significant lessons that we have learned in all of this,” Mr. Simmonds points out.Secretary for the Fletcher’s Land Parenting Association and single parent, Sheryl Hamilton vouches for the programme wholeheartedly. Before becoming a part of the Association there was much she disliked about her conduct as a parent. Now she is proud. Her children have benefited from the educational component as well as the mentoring given through Youth Opportunities Unlimited and their family life has improved dramatically. “In the workshop, you learned so much things about parenting that you weren’t doing; things that you weren’t doing quite as well and so even with my kids, my whole take on parenting changed,” she says of the experience. She notes that being a single parent with five children, she was often frustrated, but with the help received through the workshops, she can now deal with issues calmly, relate better to her children and refrain from venting her frustration negatively. “In the workshop, you learn not to do those things and then you go home and you practise and so I find that I am a much better parent and you find that you learn how to communicate better from the workshops,” she adds. “I am much much better I tell you. They (the children) are glad that I have changed. The 12 year-old says to me, ‘mummy, I want you to stay in parenting association forever’ and the 17 year-old, you can’t slip up any at all because she will say to you ‘mummy is not you is secretary for parenting association?’ You are always in line,” Ms. Hamilton says. She notes that the encounters also help parents to identify when their charges are in trouble. Fletcher’s Land, Ms. Hamilton tells JIS News, is on a path to transformation and this is a charge led by parents, who want to see their children live a good quality life and their community changed for the better. “We want to be a model community for change,” she asserts. And, a community parenting approach is one of the genius ways through which change is being fostered. How does it work? Each member of the Association is assigned to different streets in their community. “We are responsible for seeing that by 9:00 p.m. on school days, the children are off the streets… we collect data as to the number of children attending or not attending school and the reasons,” Ms. Hamilton explains. “I think every community across the length and breadth of this country should have a parenting association. CSJP will last for another two more years or so, but it is the best thing that ever happened to the inner city and I think it should continue,” she advocates. The Fletcher’s Land Parenting Association, being the first community to have a parenting association, is now actively involved in spreading the change to the communities of Trench Town and August Town by helping them to set up their own Associations. “We want get back to the basics of things. We want to look out for each other’s children. Our focus is to help reform Jamaica and we think that if we do this at the community level, you have no problem, because if each community fixes their community, then Jamaica will be fixed up automatically,” Ms. Hamilton states passionately. CSJP is leaving no stone unturned, as Mr. Simmonds says, the coverage of communities is being expanded. This, he tells JIS News, is to ensure that all communities have at least three NGOs operating in their area.Meanwhile, plans are afoot to involve the Area Youth Foundation with the current NGOs. Area Youth will utilize culture and especially film and photography as a medium to educate and train residents especially youth in the communities. Things have leveled off pleasantly, and Mr. Simmonds says the work of the CACs has helped to smooth the process significantly as it was at times “fraught with difficulty.” He says that one major obstacle, was to get people to see themselves as part of one big community, no matter where they resided in a particular area. “In Trench Town for example, we had looked at it as one community but going into Trench Town we recognized that Wilton Gardens or Rema is much different from Arnett Gardens, Federal Gardens or Rose Town. In fact, they see themselves as four different communities,” he explains. Through the CAC however, CSJP has been able to interface with the residents. “We see the CACs as very important to the sustainability of this programme,” he tells JIS News. The Programme Coordinator says the intention is to put the CACs in a position to be able to do the necessary mobilizing, networking, and lobbying to continue the services, after CSJP comes to an end in 2008. He informs that efforts are also being made to have CACs become legal entities and registered with the Department of Cooperatives and Credit Societies to help them to interface with the outside world. Resources are also being provided to the committees to help them to implement small projects and already, the United Mountain View Council has been contracted to refurbish some small facilities in the different districts of Mountain View. “It’s a great challenge to sustain these organizations but we are working with them and we hope that at the end of our programme, these will be strong organizations that can lobby, that can network and can bring benefits to their communities as well as mobilize internal resources for the betterment of the community,” Mr. Simmonds says. While not directly involved in providing employment, community action officers have helped to identify job and training opportunities for individuals under the programme and so far, some 80 persons have been placed. Mr. Simmonds is modest about the success of the CSJP, but admits that based on reports provided by NGOs, there has been a significant level of interest, success and achievements under the programme. He says that initially, it was a daunting task to get residents to participate in the programme and in the initial year the targets were not achieved, but by year two they were surpassed. “We are confident that not only are targets being achieved with the number of participants but that the outcomes from these services are meaningful,” Mr. Simmonds says. He points out that it is a significant challenge to transform a culture, which has been generations in the making. “What we are dealing with is culture, mindset, values, attitudes and it is a very significant challenge to transform those in the span of a year or two or even three,” he notes, while adding that it is important to continue the re-socialization process in the communities. “It might seem very challenging and at times very discouraging, but we have to recognize that without those interventions, things would have been worst and so we measure success not only by what we see but by the counterfactual; what would have happened if those interventions were not there,” Mr. Simmonds states. “It has been a very challenging task but there is hope,” he opines. The $20 million programme is funded jointly by the government of Jamaica and the Inter American Development Bank. In addition, there are some small grant amounts used for studies, which are provided by the National Security Ministry.